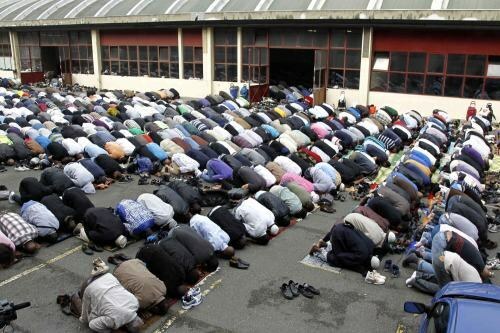 The Friday prayer is a collective afternoon congregational prayer of Muslims are held on Fridays. It is mandatory for all men. Women, children and the infirm are not obliged to visit it. Friday is a sacred day, a holiday for Muslims. Get ready for Friday with the sunset prayeron Thursday. In the night preferably to bless the Prophet not less than 300 times. Thursday and Friday follow post. Give donations, try to delight friends, visit relatives, especially parents, to visit the sick, go to the graves of loved ones, prepare for guests and family with tasty food. At dawn Friday take care of personal hygiene - take a full ritual bath, trim the hair and nails, nodosities incense and put on clean clothes. If possible, go to a meeting and listen to scholars and theologians. For Friday prayers, go early. According to a hadith, the one who comes before, is given a much greater reward. Try to take a seat in the first row. The Friday collective prayer promotes unity and integration of Muslims, strengthening the bonds of brotherhood. He also serves as atonement for the sins of a Muslim, committed in the course of a week. Try not to step over other people, when you walk in the front ranks. It is undesirable to talk, eat and drink in the mosque. During Friday prayersand Muslims are forbidden to engage in trade and other business until after the prayer. The form of Friday prayers:- Commission chetyrehjadernogo the Sunnatprayer;- listening to a sermon and awareness of behavior and actions that will benefit this and the next world;- the Commission of two RAK; - committing chetyrehjadernogo the Sunnatnamaz. RAK'a is the order of words and actions that constitute the Muslim prayer. Every RAK'a includes one waist and two bow of prostration. Each of the 5 obligatory prayers the Friday prayerand consists of different numbers of RAK. Prayer lies only in adult healthy men. The weak, the sick, the elderly, the disabled don't come to prayer. Certainly the presence of the chief Imam of the mosque or his deputies. The prayer should be performed in the largest mosque of the city, where all have enough space.